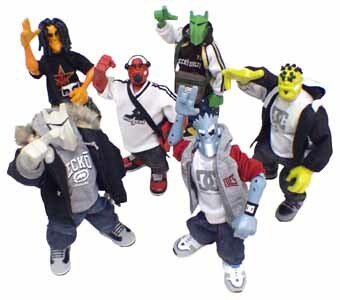 DJ Xtra is a fully poseable figure with 18 points of articulation featuring authentic clothing from Esdjco. The clothing for DJ Xtra is incredibly detailed. He has a sports style T-shirt, a pair of baggy jeans shorts, socks, shoes, a record bad and headphones. The attention to detail is amazing. This figure also warrants an extra mark out of 10 due to the fact it has some cool accessories (record bag and headphones). 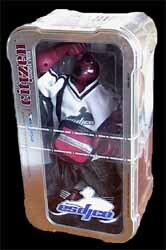 On buying this collectable figure you're left with something of a dilemma. Should you tear open the seal and enjoy this toy as its manufacturers intended? Or keep it in its original tin in the hope that one day it will be worth a small fortune? Personally I'd get the most enjoyment out of it and crack open the "collector's seal." It's well worth the risk. Or, as these are only £20 each, buy two - one to store in the attic and one to sit on your desk. There's not much more I can say about this action figure. It's cool, comes in a fantastic metal tin - and really is a must own product for any kid who wants a cool accessory for their bedroom.